About a year and a half ago, as my sister Mimi (Kidest Assegued) was cooking dinner in her the kitchen of her house in DC, she said “Meski, you have to know that my childhood friends from high school are changing lives in Ethiopia. They have an organization called Wegene committed to providing disadvantaged families opportunities towards independence. They are one of a kind and I truly think you should get involved”. Then she proceeded to call Nini Legesse the founding director of WEGENE ETHIOPIAN FOUNDATION (WEF) and introduced us over the phone. What touched me was Mimi’s enthusiasm and love for the organization and its achievement. A few days later, I met Nini in person. I found her warmth and humility moving. I was particularly impressed about her ability to bring different people together and her clarity about WEF’s sustainability. 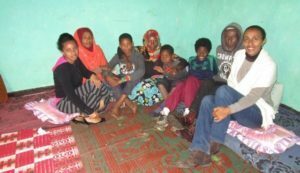 This year, in August, Mimi and her family came to Ethiopia. The first thing she wanted to do was visit the WEF office and some of the families they support. Betty (Bethlehem), a bright young girl and a former recipient and now a full time employee gave us a tour of the office. Here the children of the beneficiary families are tutored after school. The small library gives them access to books that are otherwise unavailable in their schools. 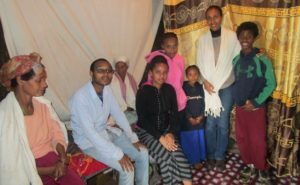 We then went to visit two families living in different parts of the Intoto mountain in Addis Ababa. The first family we visited was a single mother (name optional) with her three children and the grandmother who was blind. The oldest son (name optional) was attending college, his younger brother (name optional) was in high school and the youngest daughter (name optional)was in elementary. She (name optional) told us how her life has changed since she moved in a two room house in the mountain after living in a plastic shelter for many years. She proudly gave us a tour of her two rooms that she decorated with her children. The second family was a husband and wife with several children. The father (name optional) was enthusiastically telling us about how his life has changed since he moved in a real house with large rooms in the mountain. He has diabetes with pain on his leg. He was convinced that his new clean life compared to his previous impoverished living condition can contribute to improve his health. I humbly tip my hat to the incredible life changing work that Wegene accomplished over the last sixteen years.